Stefanie Wuschitz (founder of Mz Baltazar’s Laboratory), Circuit Mother, Vienna. Permission of: the artist. Dans cet article, je propose le concept de safer spaces (espaces sécuritaires) comme un moyen de comprendre les hackerspaces féministes. Pour y arriver, je me concentre sur la création d'espaces basés sur l'hypothèse que des valeurs communes, qu’elles soient explicites à travers un accord communautaire et/ou implicites à travers une expérience commune, permettent aux membres d’un groupe de s'épanouir et de se prendre en charge. Je suis un point de vue féministe intersectionnel entendu comme 1) un outil épistémologique qui rassemble ceux qui vivent des oppressions imbriquées et situées au croisement de leur genre, origine ethnique, classe sociale, nationalité, sexualité et autres identités, ainsi 2) qu’un engagement envers l’inclusivité radicale. L’utilisation d’un tel cadre aide à mettre au premier plan les notions latentes de privilège, d’oppression et de discrimination qui expliquent pourquoi très peu de femmes et de personnes queer s’investissent dans les hackerspaces. La création d’espaces centrés sur la fluidité du genre et sur d’autres axes d’inégalités au sein des hackerspaces n’est pas seulement stratégique, mais constitue aussi un élément constitutif des hackerspaces féministes. To know more about the Hackerspace Movement, watch a presentation by Mitch Altman, co-founder of Noisebridge, at TEDxBrussels. Hackerspaces are generally volunteer-run, self-managed, autonomous spaces. 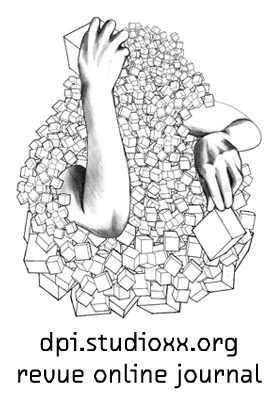 When located in social centers,[i] [ii] hackerspaces often become a hub for hacktivists in an attempt to create, conspire and communicate a collective challenge against capitalism and defend their utopian vision based on open access, horizontal collaboration, self-management coordination and the free circulation of information. [iii] The sharing of such space, where social justice issues are foregrounded, also favours the collaboration and synergy of actions between hacktivists and activists. Hacktivism[iv] comes from the contraction between hacking and activism and can be broadly understood as representing a source of technology mediated radical political (direct) actions[v] or, in other words, hacking for a political cause. Hacktivism “is not strictly the importation of activist techniques into the digital realm. Rather it is the expression of hacker skills in the form of electronic direct action.” (See metac0m 2003) The tactics used by hacktivists have, over the years, included electronic civil disobedience,[vi] virtual sit-ins,[vii] Distributed Denial of Service (DDoS) attacks), among others. To know more about DDoS attacks, watch Molly Sauter’s presentation entitled “The Ethics of Activist DDoS Actions,” at the 29th Chaos Communication Congress (29c3). Hackerspaces, whether in or outside of social centers, might not necessarily represent spaces where everyone feels safe and secure to hack, learn, socialize and experiment. As hackerspaces are generally dominated by (white) men, where a particular “dudecore” culture might be explicitly or implicitly foregrounded, such a space might be less inviting to women, queers and people of colour,[viii] demographics that are often largely missing from hackerspaces. Thus, the creation of feminist spaces or safer spaces within hackerspaces is a way to address those issues, while at the same time, creating a safer physical space attuned to intersectional feminist and queer inflections. This article is based on discussions and interviews conducted mostly with women and queers involved in hackerspaces and in the free/libre/open source movement in North America. 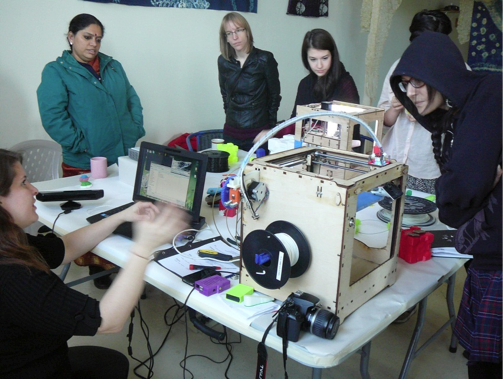 Moreover, it draws from my own experience with FouFem, a feminist hackerspace in Montreal that aims at being a safer space for (self-identified) women and queers to demystify technologies, learn from peers, and create a core group of local women interested in technologies and hacking. FouFem grew from the desire to have more women and queers in the hacker/hacktivist movement in Montreal while evolving in an environment where feminist principles would be explicitly foregrounded. FouFem also stems from the desire to imagine feminist hacker projects to expand the hacker/hacktivist movement and make it even more inclusive. As a feminist scholar and activist, I am sensitive to questions of positionality. Here, I draw from Linda Alcoff[ix] who saw key aspects of (self-identified) women and queers’ identity as markers of relational positions rather than essential qualities. 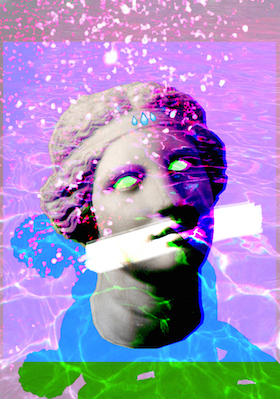 I therefore recognize that the account and analysis I present here is situated by my particular positionality of gender, class, sexual orientation, and ethnicity, among others, contributing a “partial truth”[x] to a body of feminist work on hackerspaces, specifically, and the hacker culture, more broadly. FemHack organized by FouFem, November 2012, Montreal. Permission of: Anne Goldenberg. Safer spaces are based on the assumption that shared common values, whether explicit, through a community agreement, or implicit through the sharing of values, enable members of a group to flourish, empower themselves and create community. Safer spaces “originated in women’s and queer movements of the past decades as an identifier of space that is explicitly committed to safety for individuals or communities that are targets of oppression” (p. 138). [xi] Consciousness raising groups prevalent in the United States during the women’s liberation movement of the late 1960s were among the first safer spaces that aimed at providing a safe speaking and awareness raising environment for women and queers. The notion of a safer space implies the possibility to speak and act freely, generate strategies of resistance and build community, among others (p. 24). [xii] Though the range, nature and raison d’être of safer spaces have evolved and expanded over time, the concept is still central to feminist pedagogy, organizing and liberation. Why Do We Need (Safer) Feminist Hackerspaces? In the case of feminist hackerspaces, such safer spaces are not only about safer speaking spaces, but also safer making and trying spaces. In fact, some of the premises nurtured by safer spaces are the adoption of an anti-oppressive stance as well as making well-being and empowerment a necessary goal for individual and collective liberation. [xiii] With that framework in mind, feminist hackerspaces might help individuals put a hacker identity and a feminist identity on equal footing. Therefore, instead of having to hide or somewhat compromise one’s identity over the other, those identities might be able to co-exist and flourish, leading perhaps to a distinct form of feminist hacking and/or feminist hacktivism. Moreover, the idea of creating safer spaces within hackerspaces is a way to invite and/or retain more feminists and gender non-conformists, among others, who might not fully identify with the dominant hacker culture (see Coding Freedom). [xiv] In talking about safer spaces, Dreher argues that they “might be less about an absolute security in which there is no risk, no pain and no difficult conversations, but rather more about a redistribution of the risks and discomforts of speaking and organizing”(p.17). [xv] Additionally, feminist hackerspaces might be a way to create community around shared experiences and common interests, while at the same time, sharing an understanding of what intersectional feminism in the hacker or hacktivist culture means and how to attempt to translate it within this culture. Mz Baltazar’s Laboratory organized an art workshop at Labitat, a hackerspace in Copenhagen, Denmark, March 2013. The workshop was for women and trans only. Permission of: Lesley Flanigan. When feminist and anti-oppression politics are not explicitly part of the ethos of a space whether virtual or physical, the burden of education will often be placed upon the people who are living these oppressions. The burden of educating about white supremacy will be placed upon indigenous or people of colour, while the burden of educating about gender analysis will be put upon women and queers. Having to explain the pertinence of working on gender issues in and of themselves all the time, and meeting resistance and defensiveness when trying to build such analysis in a space, can be a constant struggle for feminist and anti-oppression activists. For many feminist hackers or hacktivists, the notion that one does not need to talk about gender, race, sexual orientation, class, etc. because what matters is how well you can hack (see hacker ethics) largely disregards privileges that people have in society and constitutes part of the explanation for why there are so few women, queers and people of colour in hackerspaces, in particular, and in the hacker or hacktivist community, more broadly. [xviii] Hence, the creation of safer feminist spaces within hackerspaces may help to build community, find allies and move forward with sharing and learning skills, in a feminist and anti-oppression hacking environment. 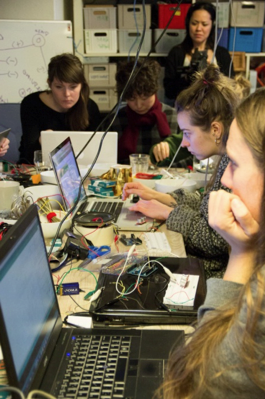 The need for and desire to create feminist hackerspaces has surfaced in recent years. These feminist endeavours have not necessarily followed the same intersectional feminist standpoint, but nonetheless have tried to create spaces where (intersectional) feminists will be able to hack and/or learn to hack together in what they might consider a safer space. 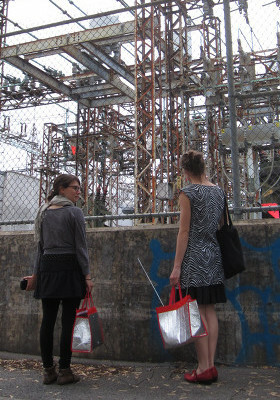 Examples of such initiatives are with the feminist hackerspace FouFem that was recently launched in Montreal, the Mz Baltazar’s Laboratory, a start-up organization and feminist hackspace in Vienna, the Anarchafeminist Hackerhive in San Francisco, the Hacktory in Philadelphia and the Miss Despionas in Tasmania, Australia. The Ada Initiative, and their AdaCamp conferences in particular, is another example of creating ad hoc safer spaces mostly for women, queers and gender non-conformists with the purpose of enhancing one’s skills through sharing, and creating national and international links of solidarity. 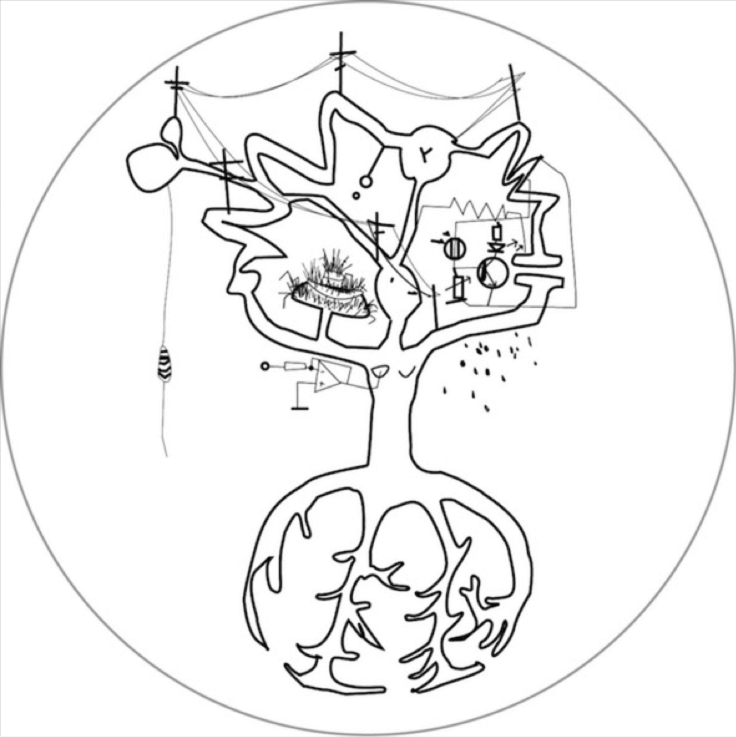 Watch Stefanie Wuschitz, founder of Mz Baltazar’s Laboratory, discussing the issue of women artists in the world of open-source technology, at TEDxBratislava in 2011. Feminist hackerspaces can be understood as safer spaces where a set of common values is foregrounded by its members. Feminist hackerspaces are not an end in themselves, but rather a means to address some of the felt shortcomings of hacktivism and to possibly help create a stronger feminist hacker (counter)culture. The safer feminist hackerspaces that have emerged in the past few years deserve much more attention from scholars, researchers, activists, feminists and hacktivists. The potentiality of creating new forms of hacking or hacktivism with feminist-queer inflections and influences as a result of the creation of feminist hackerspaces are a fascinating area to research. Academic research, particularly empirical research, is lacking on that front and would greatly inform feminist hackerspaces and feminist hacktivist initiatives. [i] Chatterton, P. (2010). “So What Does It Mean to be Anti-capitalist? Conversations with Activists from Urban Social Centres.” Urban Studies, 47(6), 1205–1224. [ii]Ruggiero, V. (2000). “New Social Movement and the ‘centri sociali’ in Milan.” Sociological Review, 48, 167-85. [iii] Juris, J. (2008). Networking Futures: The Movements against Corporate Globalization. Durham and London : Duke University Press. [iv] The distinction between “hacktivism” and “cracktivism” is important to many, particularly hacktivists. Hacktivism is used to describe politically motivated hacking that is constructive, while the latter, cracktivism, is seen as disruptive. Rather than identifying a tactic such as a DDoS attack as a hacktivist or cracktivist one, Sauter (2012), Metac0m (2003), and others, argue that it is better to analyze an action in its larger context in order to determine whether it fits into broader categories of hacktivism or cracktivism. [v] Taylor, P. (2005). “From hackers to hacktivists: speed bumps on the global superhighway?” New Media & Society, 7(5), 625-646. 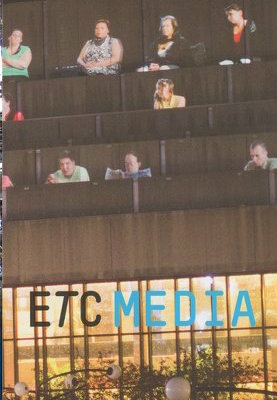 [vi] In their essay entitled Electronic Civil Disobedience (1996), the Critical Art Ensemble, a performance art and activist group, sought to replicate the “disturbances” happening in the streets into the virtual realm and called for civil disobedience online. [ix] Alcoff, L. (1988). “Cultural Feminism Versus Post-structuralism: The Identity Crisis in Feminist Theory.” Signs, 13(3), 405-436. [x] Clifford, J. (1986). “Introduction: Partial truths” In J. Clifford & G. Marcus (Eds. ), Writing culture: The poetics and politics of ethnography (pp. 1–26). Berkeley: University of California Press. [xii] Kenney, M. R. (2001). Mapping Gay L.A.: The Intersection of Place and Politics. [xiii] Newman, E. (2011), Idem. [xiv] Coleman, G. (2012). Coding Freedom: The Ethics and Aesthetics of Hacking. Princeton University Press. [xv] Dreher, T. (2009). “Eavesdropping with permission: the politics of listening for safer speaking spaces.” Borderlands ejournal, 8(1), 1-29. [xviii] For discussions on technology and intersectionality, see: Daniels, J. (2009). Cyber Racism: White Supremacy Online and the New Attack on Civil Rights. Lanham, MD: Rowman & Littlefield; Eubanks, V. (2011). Digital Dead End: Fighting for Social Justice in the Information Age. Cambridge, MA: MIT Press; Nakamura, L. (2002). Cybertypes: Race, Ethnicity, and Identity on the Internet. London: Routledge; Nakamura, L. (2007). Digitizing Race: Visual Cultures of the Internet. Minneapolis: University of Minnesota; as well as, Sassen, S. (2002). “Towards a Sociology of Information Technology.” Current Sociology, 50(3), 365–388. Sophie Toupin est chercheure associée au Five College Women’s Studies Research Center à Amherst au Massachusetts. Ses recherches portent sur la relation entre les pratiques féministes (en ligne et hors ligne) au sein des mouvements sociaux. Elle est passionnée par la radio communautaire, les médias indépendants et contribue activement au hackerspace FouFem.